I began this Email Tarot Reading site on January 29th, 2010 and of course gave myself a reading to see how it was going to go. The outcome card of the five card spread, was one of my favourite cards – The Six of Cups. I did a couple of extra spreads over the course of a few days, to confirm the reading and this card appeared each time. Take a look at the card for a few moments and consider what it means to you. Also have a think about what it might mean in relation to Email Tarot Readings. 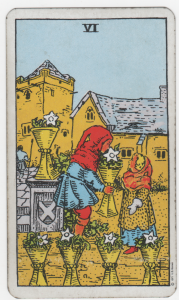 To me the Six of Cups speaks of trust, sharing and friendship – there is also something beautifully innocent about the picture on the card itself – giving and receiving gifts between friends, the intimacies shared between friends – openhearted, accepting, allowing, trusting, forgiving. Now, I wouldn’t say this site has been a huge financial success in its first year, but it has certaintly brought me riches in other ways. For, over the course of the year, I have had the great honour of being trusted by people who have shared their problems with me. In return I have done my best to shine light and bring positive energy through my readings. I have been contacted by people from all over the world and some of these people have become my friends. I feel as though my own world has been enlarged and enriched as a result. I had no idea that this would happen when I started out. The outcome card I have drawn for this next year of Email Tarot Reading, is one of my all time favourite cards – The High Priestess – which augers well both for my own developing intuition and for the intuition of the people who visit this site. For, as much as I like to give readings and help people with their problems, I would love others to use and trust their own intuitive abilities too. Hopefully, we will all become wiser and more in touch with our inner knowing over the course of the coming year.